The Book Chook: Children’s Book Review, Sleep Tight, Anna Banana! 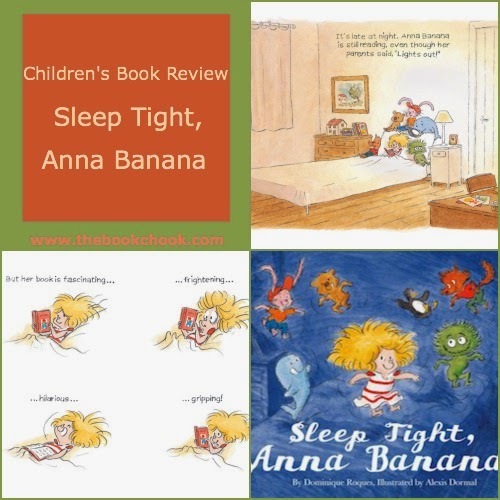 Children’s Book Review, Sleep Tight, Anna Banana! Sleep Tight, Anna Banana! was written by Dominique Roques, illustrated by Alexis Dormal, translated into English by Mark Siegel and published by First Second Books (2014). You may recall I have also reviewed another First Second book, Fairy Tale Comics. I was intrigued to see First Second had published its first children’s picture book, wondering if it would include comic elements. It does! Anna Banana can't settle down tonight, even though her stuffed animal friends are tired and just want to sleep. They suffer through delay after delay and excuse after excuse, until Anna Banana is finally sleepy. And then . . . it's time for their revenge! Anna Banana is about to get a taste of her own medicine. Anna Banana is a fantastic character—a lively little girl and a fearsome tyrant to her stuffed animal pals. The first of two picture books featuring this character, Sleep Tight, Anna Banana! is sure to be a hit with the youngest of readers . . . and with their parents! Mother and son team, Roques and Dormal, bring a combined exuberance to this charming hybrid of picture book and comic. There’s humour a-plenty throughout the tale. My favourite panel has to be the one where an indignant Anna Banana protests about the noise her toys are making in retaliation to her noise, with a shouted “Are you nuts?” They gaze back at her with a kind of “How do you like them apples, sister?” look. Speech bubbles, sounds and movement lines add a comic charm to the story. Kids will love this feisty heroine! I really enjoyed the fact that she loves to read so much that she can’t turn off her light, but she also won’t sleep without her stuffed animals. I also had to giggle over illustrations like the one of her doing a seated spring into the air to capture Pingpong when he tries to escape from the bed. Sleep Tight, Anna Banana! will leave kids and adults alike with a broad smile. Do seek it out for your library. It’s charming and funny, and makes a great introduction to graphic novel style for younger children.